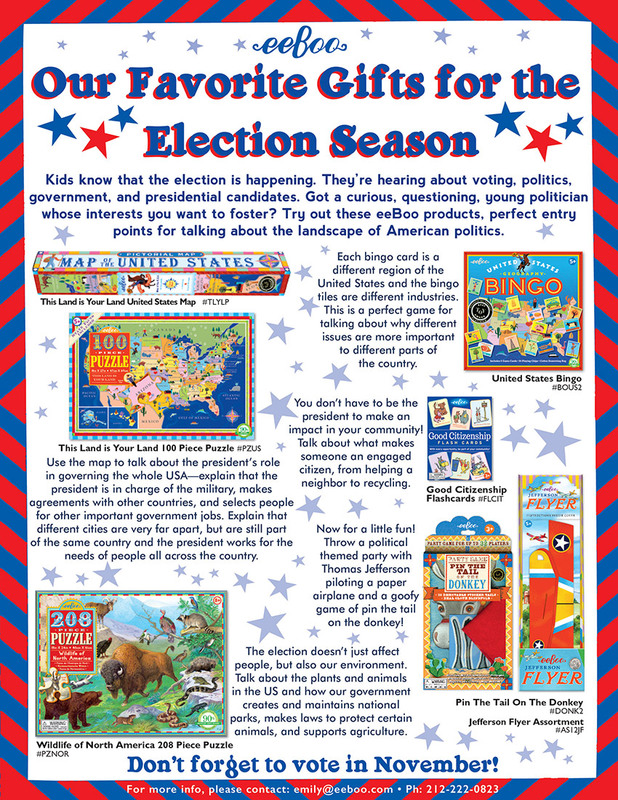 shop eeBoo’s election themed products & more educational toys here. 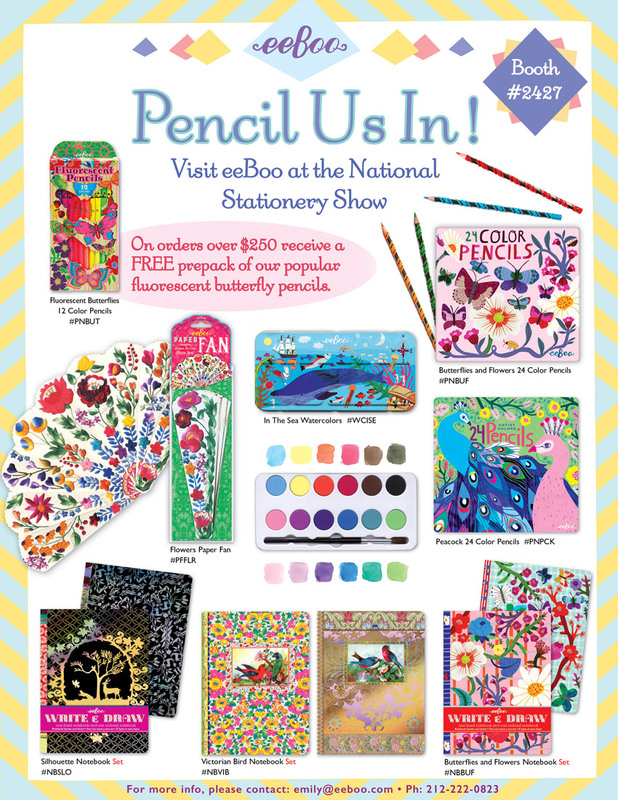 Use promo code PENCIL for Free Shipping on your order over $50. US Only. Through 10/15/16. Hue Do You Love? eeBoo’s New Plush! Made with love by eeBoo. Find at your local retailer, or order here. Orders on our website are filled by local retailers whenever possible. Everyone likes a summer party. And everyone loves a thoughtful guest. At your next gathering, bring a lovely and unique gift to delight your hosts and show your gratitude. An ideal gift for a weekend visit with old friends. Beautifully illustrated by Monika Forsberg, the puzzle image can be constructed from all sides, making it the perfect group activity. $18 each. 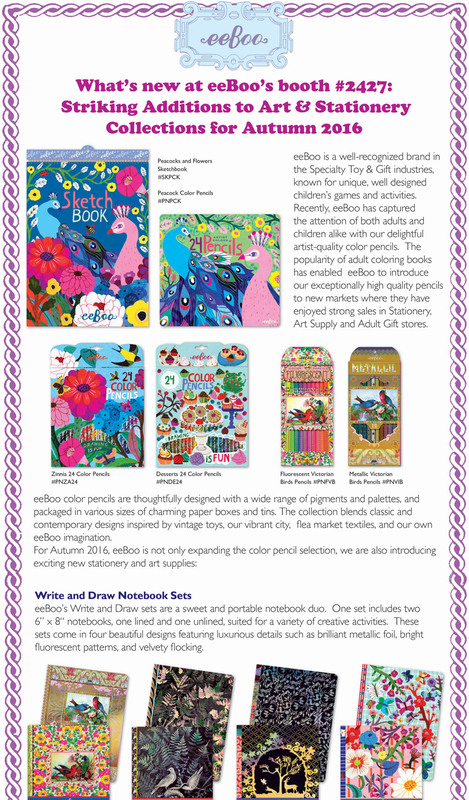 At your next summer soiree, tell your hosts you think they’re sweet and creative with this dessert-themed sketchbook and color pencil set. $19 for set. If your hosts have a flare for the dramatic, they’ll love these colorful and festive paper fans. 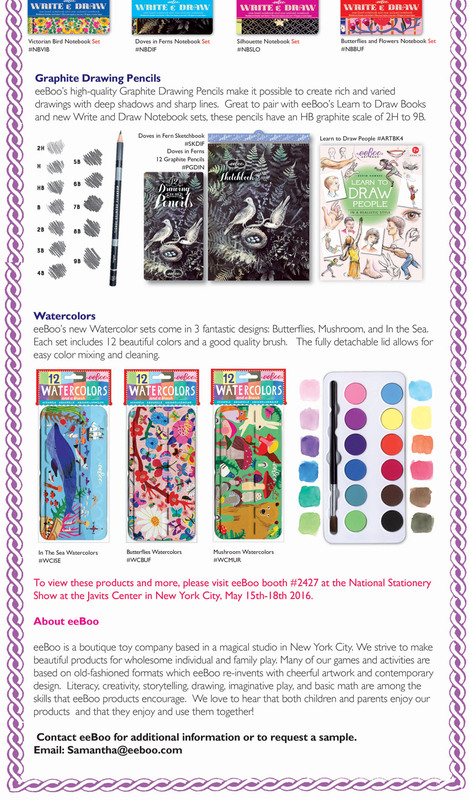 Choose from three stunning designs: Flowers, Butterfly, and Peacock. $5 each. Mix and match an assortment of playing card games: Go Fish, Hearts, and Happy Families are eeBoo favorites. These portable packs provide hours of fun for all ages. $24 for bundle of 3. For going-away gatherings, wish your friends bon voyage with our simple & fun language flashcards in Spanish and French. $12 each. & we’ll regram to our followers on eeBoo’s social media channels! 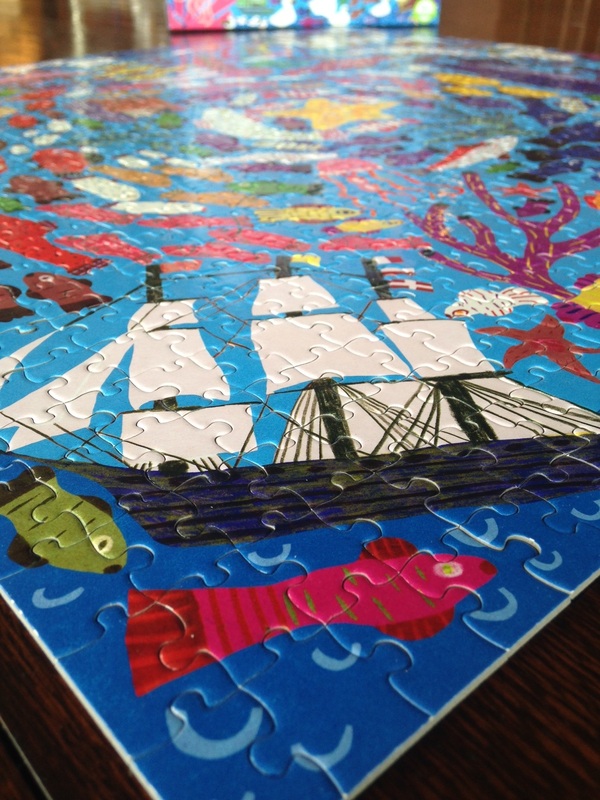 Below the Surface 1008 Piece Puzzle- A Review! 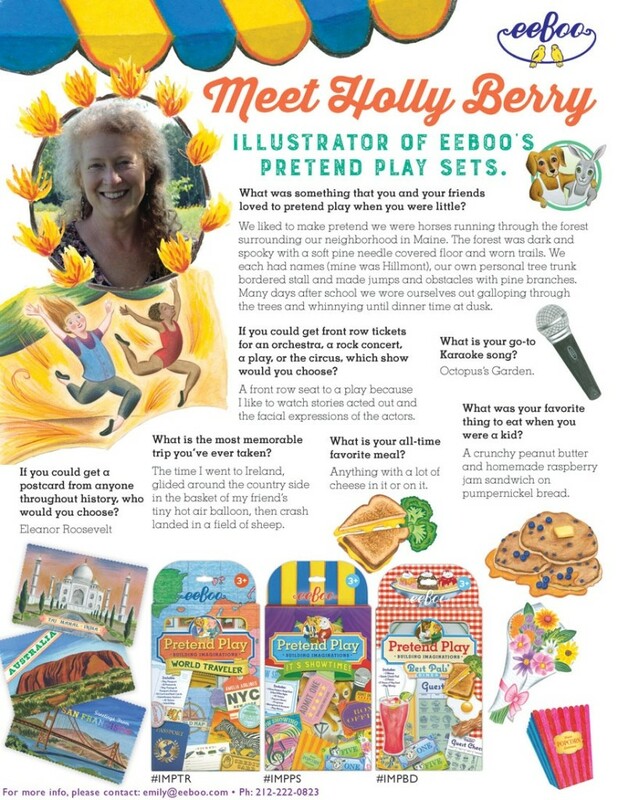 I’m Madeleine, a former employee and fan of eeBoo. I’ve always been a fan of grand gestures with a dramatic flair, which is why I decided that my family should meet my boyfriend’s family in a mansion that can be only be described as an evil villain’s lair. Sure, they could have met in Kansas City, where they both live, but what is the fun in that? That is how it came to pass that we spent a week in a four-story Airbnb mansion in Colorado. What we didn’t expect was the daily snow that comes with staying on top of a mountain in late April. 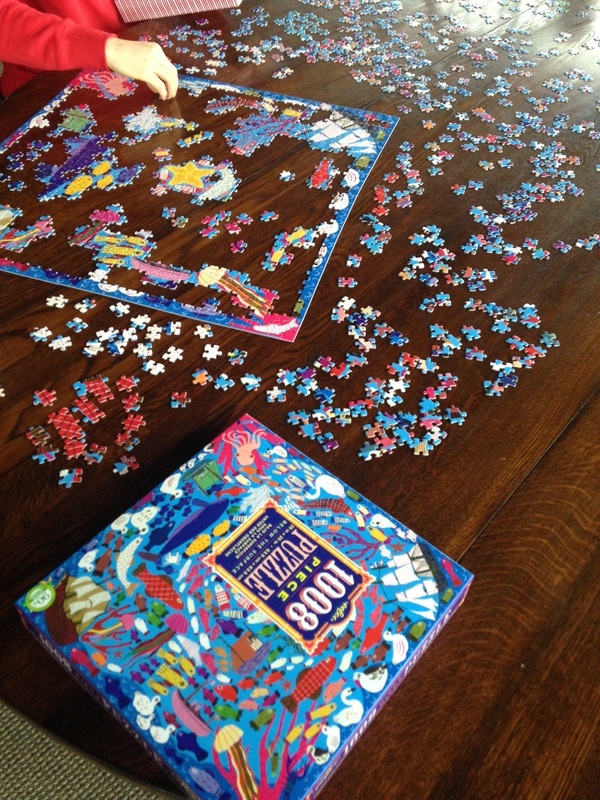 Thank goodness I brought the eeBoo Below The Surface 1008 piece puzzle! 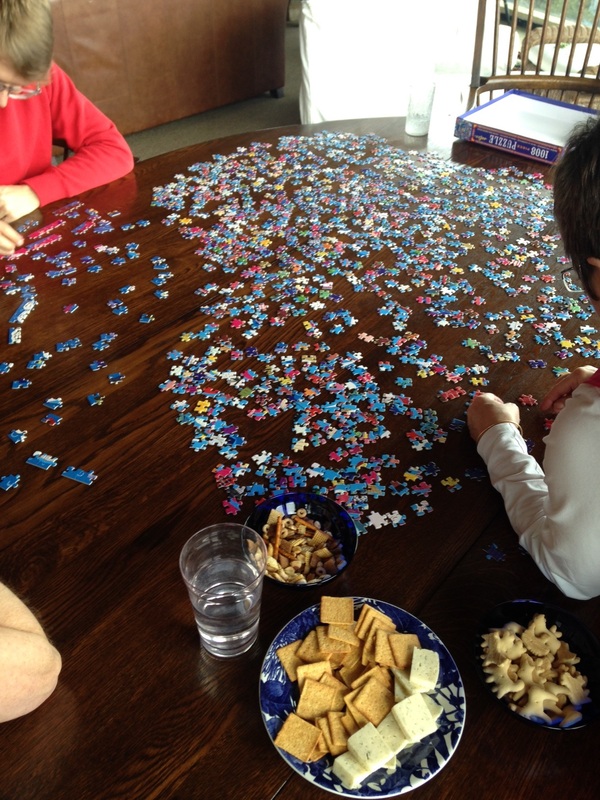 We cracked open the box and sat at the table near the cozy fire to start flipping all of the pieces right side up. 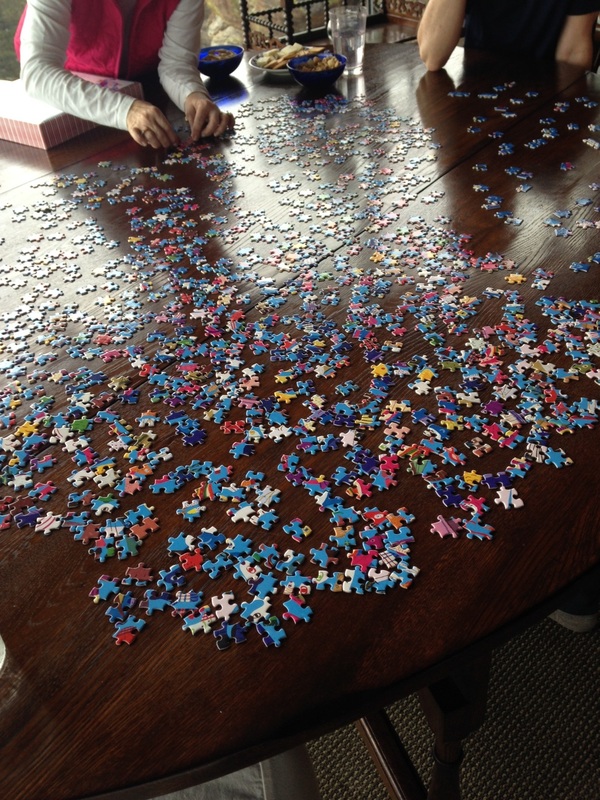 What I love about this puzzle is that everyone can work on it at once from all sides and angles. Monika Forsberg‘s art is orbicular around a central starfish that acts as the puzzle’s Northern Star. The first day we didn’t get very far. We put together some of the edges and started grouping together the schools of fish. I named myself the Boat Captain and started collecting the pieces for all the boats. I hoping the nickname Boat Captain will stick, so please continue to call me that. Day two: we got all of the edges together, then we really started cooking with oil. Pieces were flying left and right. The box was handed around, so that people could look at the the artwork we needed to put together. We worked as a team on the coral. I placed the final ducks and swans around the edges. As a team, we dove into the schools of fish deep below the surface. Day three: our spirits were higher than ever. We knew we would complete the puzzle that day. This puzzle is challenging, because there are very similar schools of fish and birds on different sides of the puzzle. You may think that you found a piece that goes with the section you are working on, only to discover that it goes on the opposite side. I may be a mere Boat Captain, but I would say this is the hardest 1008 piece puzzle that I’ve ever put together (and the only 1008 piece puzzle). 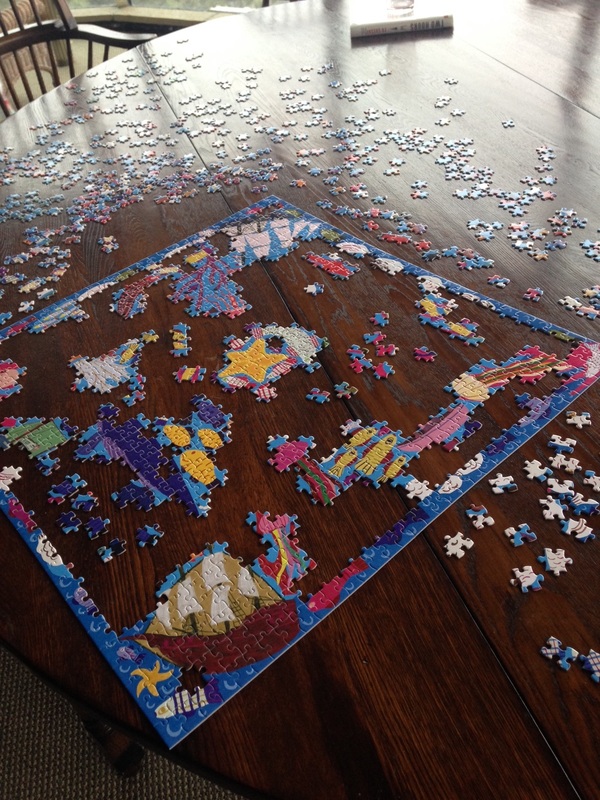 I’d recommend the Below the Surface puzzle for older kids and adults to work together on. Thanks eeBoo, for helping our families come together. We had a blast below the surface! 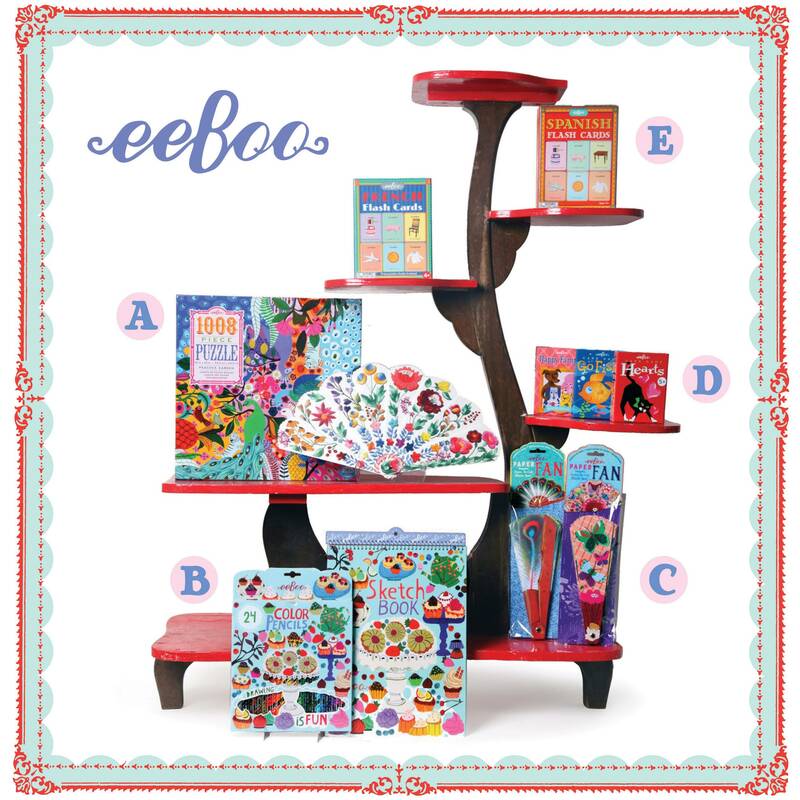 Images & review for eeBoo by Madeleine Burkart. 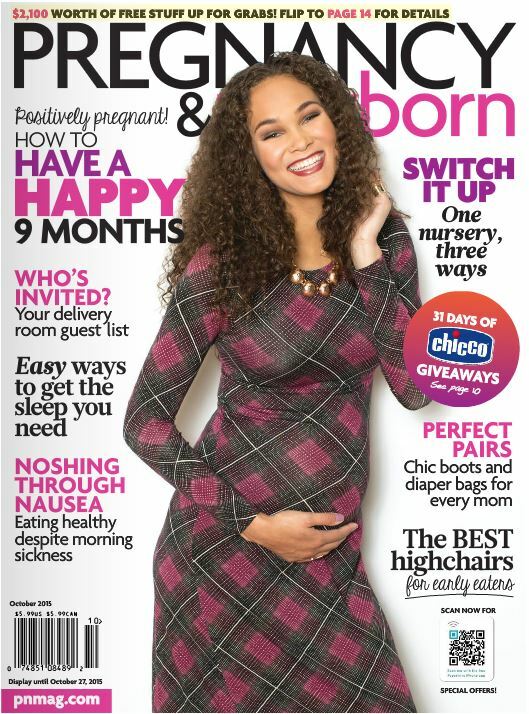 Holiday 2015 has been a bustling season for eeBoo in the press! 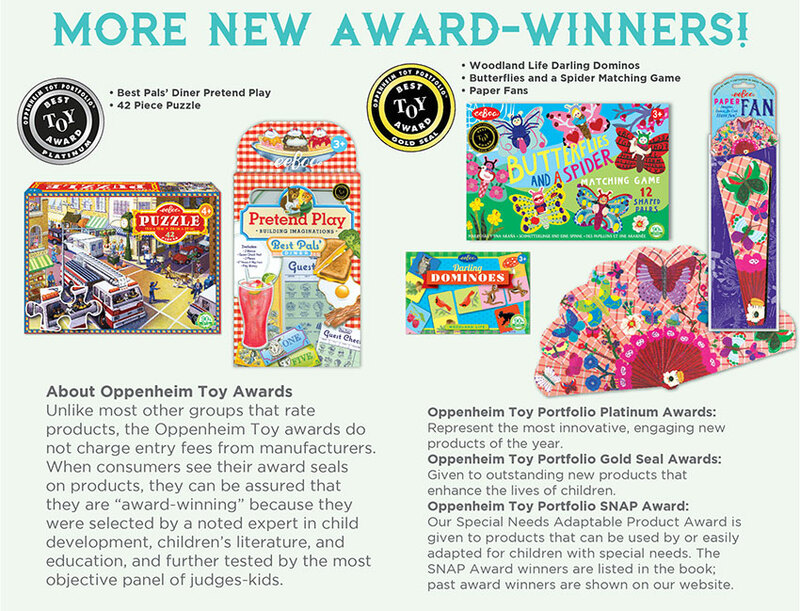 Good Housekeeping loved our Greenmarket Game so much, that they awarded it as a best kid-tested toy of 2015. 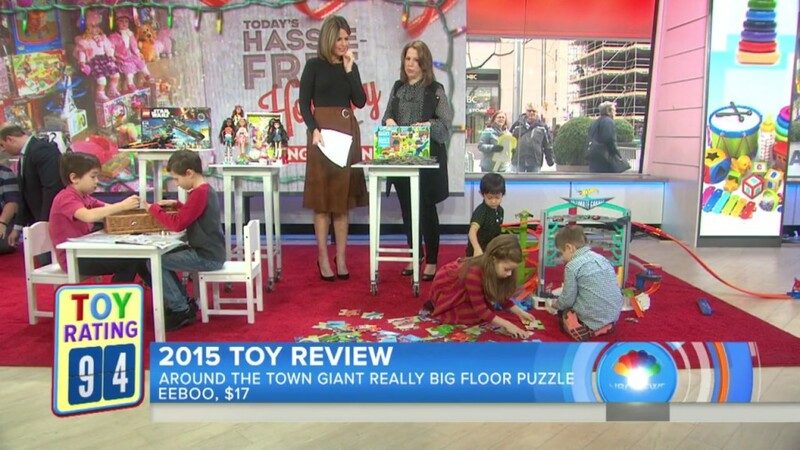 Meanwhile, over at the Today Show, the Oppenheim Toy Portfolio named our decidedly low-tech Giant Floor Puzzle as the winner in their Best Toy 2015 series, as it scored the highest among several toys closely reviewed by children, meaning it is fun to look at and easy to play with! Our Noisy Ball continues to be a distinct choice for children under a year to play with, as Parents Magazine included it in their roundup of American Baby’s Best Toys of 2015, and eeBoo classic, About Face has a shining moment on HLN weekend express as a best toy for children with special needs with its endless combination of objects to create expressions! 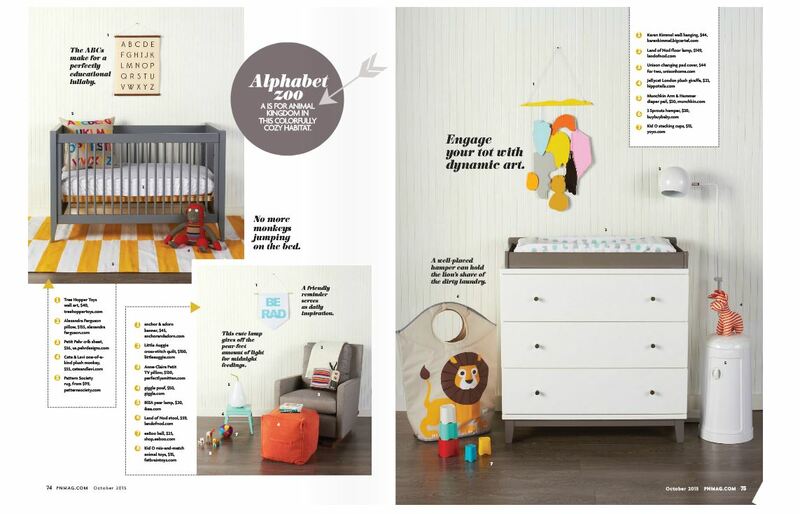 eeBoo’s Noisy Ball is spotted in this nursery feature in Pregnancy and Newborn Magazine’s October 2015 issue.